This is useful, I will be travelling to the UK. I will visit Waterstones to see if they have any of these titles. Unfortunately I am not sure whether any of them will be available in the UK, and I know that at least two were published in Ghana, and possibly one other . And none of these publishers are known for their international reach, at least as far as I know. I hope they make copies available here in South Africa. Distribution has often been a major problem. Not sure you will have much look on that front. Even finding copies here in Ghana can be a struggle! 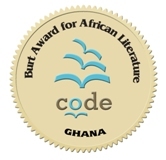 can you imagine the same publisher whose authour won from last year won again this year when the award criteria indicated that publishing houses who win in a current year cannot submit another manuscript in the following year? try again… it sounds fishy to me. I think if you are interested in submitting a work for consideration for the Burt prizes you should work with a publisher and then if it is considered good the publisher submits the manuscript.